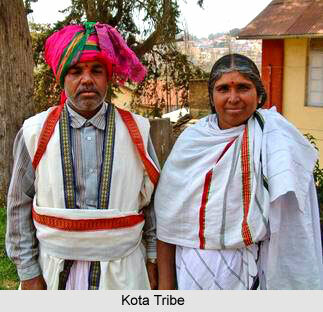 The Kotas inhabit seven villages (Kotagiri or kokal), of which six—Kotagiri, Kil Kotagiri, Todanad, Sholur, Kethi and Kunda—are on the Nilgiri plateau, and one is at Gudalur at the north-west base of these hills. They form compact communities, and, at Kotagiri, their village consists of detached huts, and rows of huts arranged in streets. The huts are built of mud, brick, or stone, roofed with thatch or tiles, and divided into living and sleeping apartments. The floor is raised above the ground, and there is a verandah in front with a seat on each side whereon the Kota loves to “take his siesta, and smoke his cheroot in the shade,” or sleep off the effects of a drinking bout. The door-posts of some of the huts are ornamented with carving executed by wood-carvers in the plains. A few of the huts, and one of the forges at Kotagiri, have stone pillars sculptured with fishes, lotuses, and floral embellishments by stone-carvers from the low country. It is noted by Breaks that Kurguli (Sholur) is the oldest of the Kota villages, and that the Badagas believe that the Kotas of this village were made by the Todas. At Kurguli there is a temple of the same form as the Toda dairy, and this is said to be the only temple of the kind at any Kota village. The Kotas speak a mixture of Tamil and Kanarese, and speak Tamil without the foreign accent which is noticeable in the case of the Badagas and Todas. According to orthodox Kota views, a settlement should consist of three streets or keris, in one of which the Terkaran or Devadi, and in the other two the Munthakannans or Pujaris live. At Kotagiri the three streets are named Kilkeri, Nadukeri, and Melkeri, or lower, central, and upper street. People belonging to the same keri may not intermarry, as they are supposed to belong to the same family, and intermarriage would be distasteful. Nadukeri. First wife Kilkeri, second wife Melkeri. The Kota settlement at Sholur is divided into four keris, viz. :—amreri, kikeri, korakeri, and akkeri, or near street, lower street, other street, and that street, which resolve themselves into two exogamous groups. Of these, amreri and kikeri constitute one group, and korakeri and akkeri the other. On the day following my arrival at Kotagiri, a deputation of Kotas waited on me, which included a very old man bearing a certificate appointing him headman of the community in recognition of his services and good character, and a confirmed drunkard with a grog-blossom nose, who attributed the inordinate size thereof to the acrid juice of a tree, which he was felling, dropping on it. The besetting vice of the Kotas of Kotagiri is a partiality for drink, and they congregate together towards dusk in the arrack shop and beer tavern in the bazar, whence they stagger or are helped home in a state of noisy and turbulent intoxication. It has been said that the Kotas “actually court venereal disease, and a young man who has not suffered from this before he is of a certain age is looked upon as a disgrace.” The Kotas are looked down on as being unclean feeders, and eaters of carrion ; a custom which is to them no more filthy than that of eating game when it is high, or using the same tooth-brush week after week, is to a European. They have been described as a very carnivorous race, who “have a great craving for flesh, and will devour animal food of every kind without any squeamish scruples as to how the animal came by its death. The carcase of a bullock which has died of disease, or the remains of a deer half devoured by a tiger, are equally acceptable to him.” An unappetizing sight, which may be witnessed on roads leading to a Kota village, is that of a Kota carrying the flesh of a dead buffalo, often in an advanced stage of putridity, slung on a stick across his shoulders, with the entrails trailing on the ground. Colonel Ross King narrates that how he once saw a Kota carrying home a dead rat, thrown out of a stable a day or two previously. When I repeated this story to my Kota informant, he glared at me, and bluntly remarked in Tamil “The book tells lies.” Despite its unpleasant nature, the carrion diet evidently agrees with the Kotas, who are a sturdy set of people, flourishing, it is said, most exceedingly when the hill cattle are dying of epidemic disease, and the supply of meat is consequently abundant. The Kotas are blacksmiths, goldsmiths, silversmiths, carpenters, tanners, rope-makers, potters, washer men, and cultivators. They are the musicians at Toda and Badaga funerals. It is noted by Dr. W. H. R. Rivers that ” in addition they provide for the first Toda funeral the cloak (putkuli) in which the body is wrapped, and grain (patm or samai) to the amount of five to ten kwa. They give one or two rupees towards the expenses, and, if they should have no grain, their contribution of money is increased. At the marvainolkedr (second funeral ceremony) their contributions are more extensive. They provide the putkuli, together with a sum of eight annas, for the decoration of the cloak by the Toda women. They give two to five rupees towards the general expenses, and provide the bow and arrow, basket (tek), knife (kafkati), and the sieve called kudshmurn. Though all classes look down on the Kotas, all are agreed that they are excellent artisans, whose services as smiths, rope and umbrella makers, etc., are indispensable to the other hill tribes. The strong, durable ropes, made out of buffalo hide, are much sought after by Badagas for fastening their cattle. The Kotas at Gudalur have the reputation of being excellent thatchers. The Todas claim that the Kotas are a class of artisans specially brought up from the plains to work for them. Each Toda, Badaga, Irula, and Kurumba settlement has its Muttu Kotas, who work for the inhabitants thereof, and supply them with sundry articles, called muttu, in return for the carcasses of buffaloes and cattle, ney (clarified butter), grain, plantain, etc. The Kotas eat the flesh of the animals which they receive, and sell the horns to Labbai (Muhammadan) merchants from the plains. Chakkiliyans (leather-workers) from the plains collect the bones, and purchase the hides, which are roughly cured by the Kotas with chunam (lime) and avaram (Cassia auriculata) bark, and pegged out on the ground to dry. The Kota blacksmiths make hatches, bill-hooks, knives, and other implements for the various hill tribes, especially the Badagas, and also for European planters. Within the memory of men still living, they used to work with iron ore brought up from the low country, but now depend on scrap iron, which they purchase locally in the bazar. The most flourishing smithy in the Kotagiri village is made of bricks of local manufacture, roofed with zinc sheets, and fitted with anvil pincers, etc., of European manufacture. As agriculturists the Kotas are said to be quite on a par with the Badagas, and they raise on the land adjacent to their villages crops of potatoes, bearded wheat (akki or rice ganji), barley (beer ganji), kirai (Amarantus), samai (Panicum miliare), korali (Setariaiialica), mustard, onions, etc. At the revenue settlement, 1885, the Kotas were treated in the same way as the Badagas and other tribes of the Nilgiris, except the Todas, and the lands in their occupation were assigned to them at rates varying from ten to twenty annas per acre. The bhurty or shifting system of cultivation, under which the Kotas held their lands, was formally, but nominally, abolished in 1862-64; but it was practically and finally done away with at the revenue settlement of the Nilgiri plateau. The Kota lands are now held on puttas under the ordinary Ryotwari tenure. In former days, opium of good quality was cultivated by the Badagas, from whom the Kotas got poppy-heads, which their herbalists used for medicinal purposes. At the present time, the Kotas purchase opium in the bazar, and use it as an intoxicant. The Kota women have none of the fearlessness and friendliness of the Todas, and, on the approach of a European to their domain, bolt out of sight, like freighted rabbits in a warren, and hide within the inmost recesses of their huts. As a rule they are clad in filthily dirty clothes, all tattered and torn, and frequently not reaching as low as the knees. In addition to domestic duties, the women have to do work in the fields, fetch water and collect firewood, with loads of which, supported on the head by a pad of bracken fern (Pteris aquilina) leaves, and bill-hook slung on the shoulder, old and young women, girls and boys, may continually be seen returning to the Kotagiri village. The women also make baskets, and rude earthen pots from a black clay found in swamps on a potter’s wheel. This consists of a disc made of dry mud, with an iron spike, by means of which it is made to revolve in a socket in a stone fixed in the space in front of the houses, which also acts as a threshing-floor. The earthenware vessels used by the Todas for cooking purposes, and those used in dairy work, except those of the inner room of the (sacred dairy), are said by Dr. Rivers to be made by the Kotas.